Bioethanol is ethanol produced from agricultural feedstock and has been commercially used as a fuel since as early as 1931. The US and European gasoline fuel markets utilize ethanol as a blend component whilst in South Africa we have been utilizing it as an industrial solvent and an additive to alcoholic beverages. Bioethanol is produced from food crops such as sorghum, maize, wheat, barley and sugar cane. Presently bioethanol fuel is widely used in Brazil (from sugar cane), in the United States (from maize) and in Australia (also from sugar cane), and together these countries account for a large percentage of the world’s ethanol fuel production. Ethanol acts as an oxygenated additive and adds volume to fuel, while eliminating the addition of methyl tertiary-butyl ether (MTBE) currently found in fuel developed by some refiners. MTBE is a gasoline additive, used as an oxygenate to raise the octane number. Its use is controversial in the US and declining in that country in part because of its occurrence in groundwater and legislation favoring ethanol use. Ethanol has a higher octane rating than ethanol-free gasoline. This allows for an increase in an engines compression ratio, which in turn results in increased thermal efficiency. Biomass goes through a size-reduction step to make it easier to handle and to make the ethanol production process more efficient. Agricultural residues go through a grinding process to achieve a uniform particle size. This passes through a control process and on to the starch conversion process. Dust from the different steps is collected in a filter system. In this step, the hemicellulose fraction of the biomass is broken down into simple sugars. A chemical reaction called hydrolysis occurs when dilute sulfuric acid is mixed with the biomass feedstock. In this hydrolysis reaction, the complex chains of sugars that make up the hemicellulose are broken, releasing simple sugars. The complex hemicellulose sugars are converted to a mix of soluble five-carbon sugars, xylose and arabinose, and soluble six-carbon sugars, mannose and galactose. A small portion of the cellulose is also converted to glucose in this step. The cellulase enzymes that are used to hydrolyze the cellulose fraction of the biomass are grown in this enzyme production step. Alternatively the enzymes might be purchased from commercial enzyme companies. During the cellulose hydrolysis step, the remaining cellulose is hydrolyzed to glucose. In this enzymatic hydrolysis reaction, cellulase enzymes are used to break the chains of sugars that make up the cellulose, releasing glucose. Cellulose hydrolysis is also called cellulose saccharification because it produces sugars. This liquification/saccharification system is an energy saving process with high yield. The glucose is converted to ethanol, through a process called fermentation. 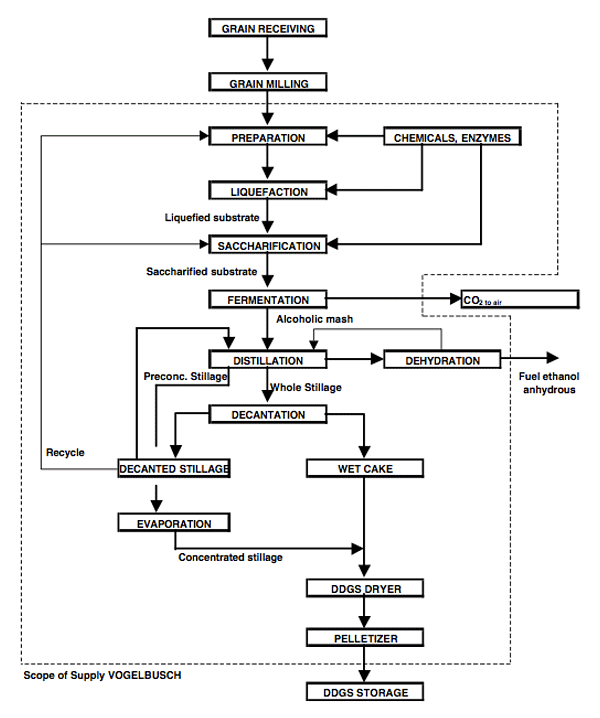 Fermentation is a series of chemical reactions that convert sugars to ethanol. The fermentation reaction is caused by yeast or bacteria, which feed on the sugars. As the sugars are consumed, ethanol and carbon dioxide are produced. The hemicellulose fraction of biomass is rich in five-carbon sugars, which are also called pentoses. Xylose is the most prevalent pentose released by the hemicellulose hydrolysis reaction. In this pentose fermentation step, xylose is fermented using Zymomonas mobilis or other genetically engineered bacteria. The fermentation product from the glucose and pentose fermentation is called ethanol broth. In this ethanol recovery step the ethanol is separated from the other components in the broth. A final dehydration step removes any remaining water from the ethanol. The plant will consist of a multi-pressure distillation system, making more economic use of heat energy and thus reducing steam consumption. There are a number of different columns, which operate at different pressure levels so that one column can be heated with the overhead vapours of another. Hot silage is stored in an intermediate storage tank, from where it is pumped to decanters for removal of solids. Solids leaving the decanters are premixed with concentrated silage and fed by the mixing system to the drier. Drying of decanter cake and concentrated silage is done in a rotary drum dryer driven by natural gas. The dried product is transported by a conveyor system to the storage area or to the pelletizer. DDGS is then conditioned with steam and water in the DDGS humidifiers and after intensive mixing the humid DDGS is pressed to pellets. After the pellets have been cooled they are transported to the client’s DDGS area for collection or further transportation.